Natick has been the home to a number of businesses over its history. From our early days manufacturing leather shoes to the now growing commercial center, around the Natick Mall, this community has always had an eclectic and strong commercial history. 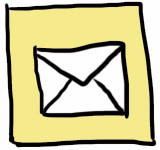 One former Natick business institution was Grandmother’s Mincemeat. This particular brand of mincemeat began being commercially produced here in Natick in 1899. The company would continue operating for over a hundred years, until it was sold in December of 2003. The company’s founder Harrison L. Whipple had been manufacturing mincemeat using his grandmother’s recipe for several years before 1899, when he began to produce it commercially. In 1899 he formally started the Whipple Company to produce and distribute their already popular product. 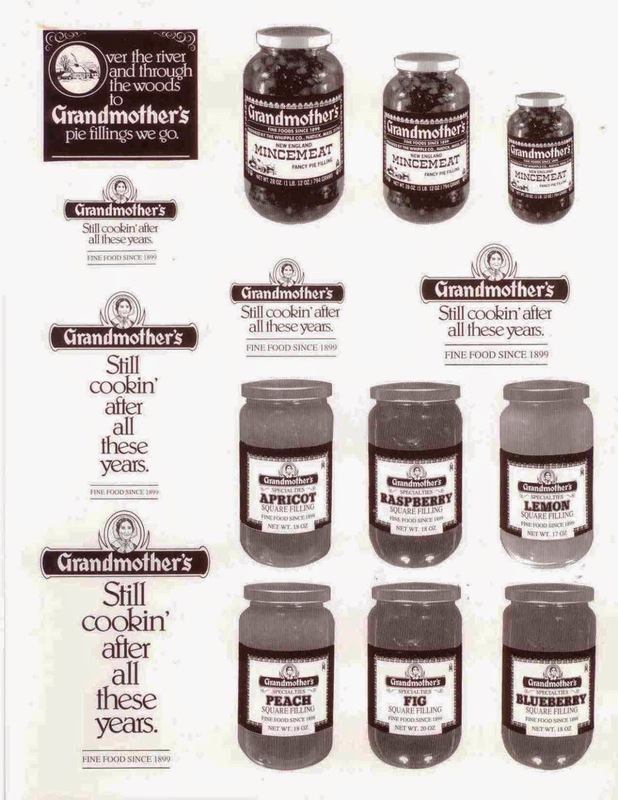 Due to the recipe’s origin Whipple, marketed his products using actual images of his grandmother, Mrs. Sophia Tuttle, and branded the products as Grandmothers’ Mincemeat in her honor. 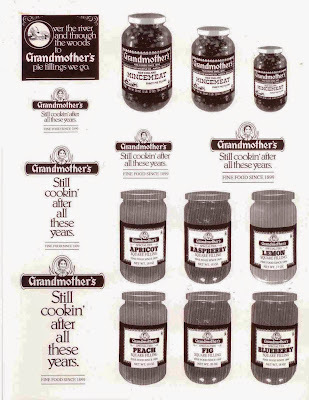 Lewis E. Whipple, Harrison’s son, took over business in 1908 and began expanding their range of products to include other kinds of pie filling as well as preservatives, jams, syrups and more, all under the “Grandmother’s” brand. Other recipes for different flavors of mincemeat were introduced to keep up with changing demands but the original recipe from Sophia Tuttle remained in use throughout the company’s existence. Grandmother’s products grew in popularity through the 1900s and even absorbed several other local food companies. The Whipple Company purchased A.A. Knights in 1960 and the producers of Bostonia Brand Soda Fountains in 1962. Throughout the company’s existence their central production factory was located here in Natick though it moved several times within the community as the company expanded. Their last location on North Main Street, where they moved in 1947, proved to be their longest lasting location. 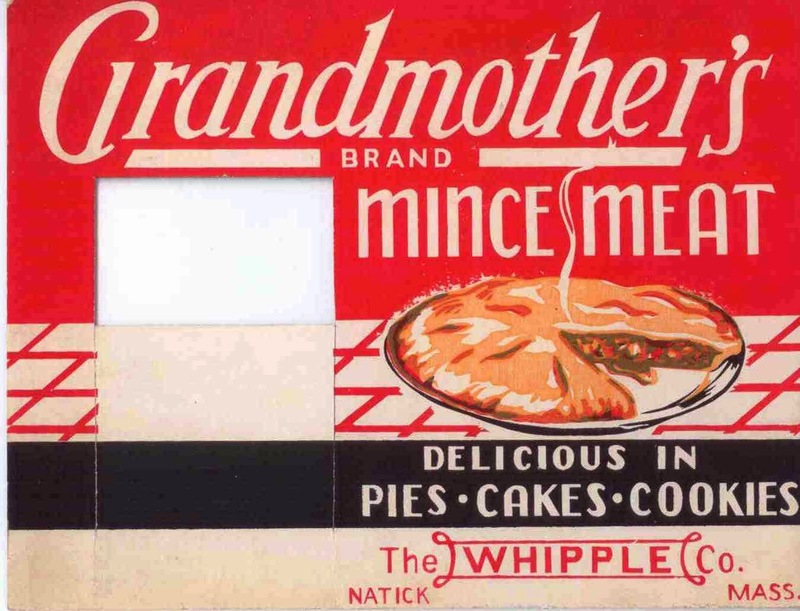 Over the company’s long history, the Whipple Company and Grandmother’s Mincemeat found a number of different ways to promote their expanding market of products. Below are a series of promotional materials from our archives that Grandmother’s put out over its long history. 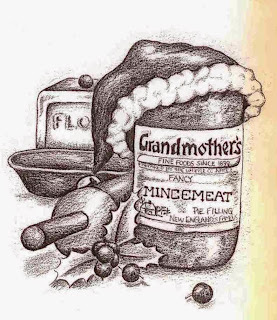 This image is a promotional illustration that was part of a Christmas themed Grandmother’s Mincemeat advertisement. Mincemeat pies are a popular holiday treat and many of the company’s ad campaigns focused on holiday themes. This trade card is another Grandmother’s Mincemeat advertisement, this time in the form of a promotional song. 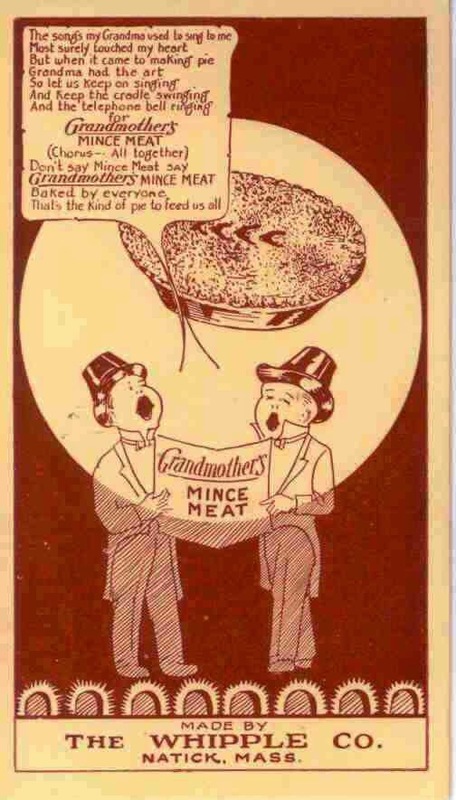 The singer’s pilgrim hats are another attempt by the Whipple Company to connect their product to the holidays, when mincemeat would likely be most popular. 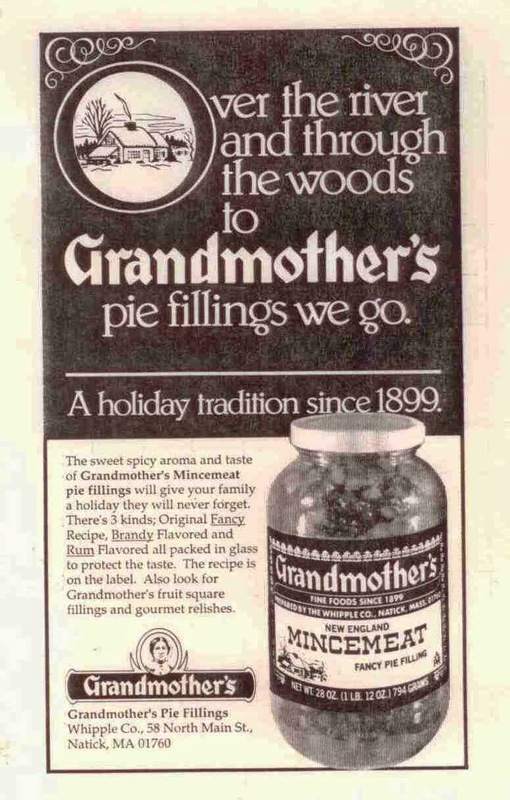 This longer print advertisement for Grandmother’s mincemeat references the classic song “Over the River and Through the Wood.” Grandmother’s branding focused on promoting their product as being connected to the holidays and especially connected to family; which considering the company’s origin was appropriate. Unlike the previous advertisements this one could be run at any time of the year. The rectangular white and black flap was intended to be folded back so that a jar of mincemeat could be placed in the opening allowing the ad to stand up straight as a promotional piece in a store window. Grandmother’s didn’t just make mincemeat. As the Whipple Company expanded, the Grandmother’s brand did too. This advertisement for a variety of fruit based pie fillings shows how the company expanded its reach beyond standard mincemeat. Different fruit flavors like lemon and raspberry could be sold year round and had less of a seasonal association the way mincemeat did. 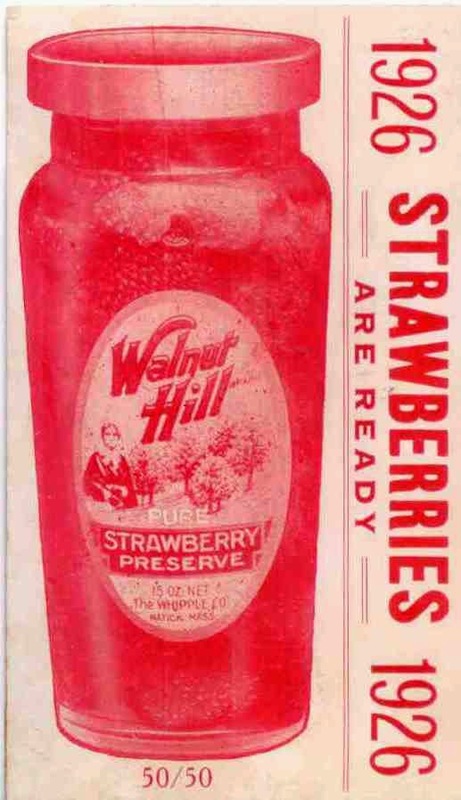 By expanding into other products beyond mincemeat the Whipple Company also expanded their branding, though they continued to use themes related to Natick. These Strawberry preserves also made by the Whipple Company but were part of their Walnut Hill Brand of jams and preserves, named for Walnut Hill in Natick. Though this is not technically Grandmother’s brand, the image of Grandmother Tuttle is still present on the label. 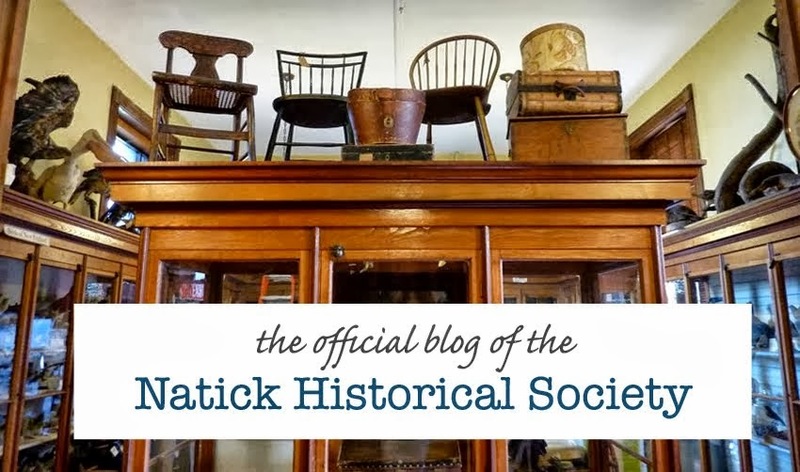 The Natick Historical Society is lucky to have an extensive collection of items and archival materials related to this important part of the commercial history of Natick. 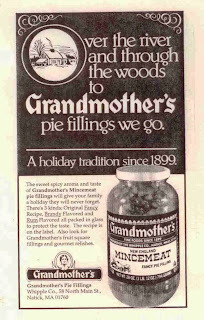 Our archives relating to the history of the Grandmother’s Mincemeat Company were recently reorganized by an archival intern here at the historical society. Many of these objects are on display in our permanent collection detailing Natick’s commercial history.